Does this remind you of meals at your house? Turn chaos into a dining symphony with the Lil’ Diner. The Lil’ Diner has changed my life, or at least my dining experiences with Mason. He was the ultimate plate thrower. Not out of anger, but out of sheer enjoyment, Mason would hurl his plates, food and all, across the dining room. Not anymore! 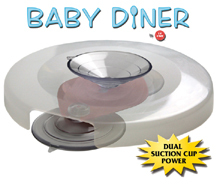 The Lil’ Diner is super easy to assemble and even easier to adhere to a plate and then to the highchair or table top. The dual suction cup power keeps the plate safely and securely attached to the eating surface. They even have attachments for cups and a screw on for a tables with any type of surface. Giveaway will end on May 14, 2011 at 11:59 pm EST. Open to US and Canada only. Please make sure your email address is public on your profile or leave with your comments so I can contact you should you win. ***When entering a giveaway, you MUST complete the mandatory entry requirements FIRST before completing your optional entries. If you do not successfully complete the mandatory entry or leave a valid email address, then you will be disqualified from the contest. *** The winner will be chosen by random.org and announced here as well as emailed and will have 48 hours to respond or a new winner will be chosen. I received no monetary compensation for this review but was supplied this product free of charge; however, all opinions are still 100% my own.